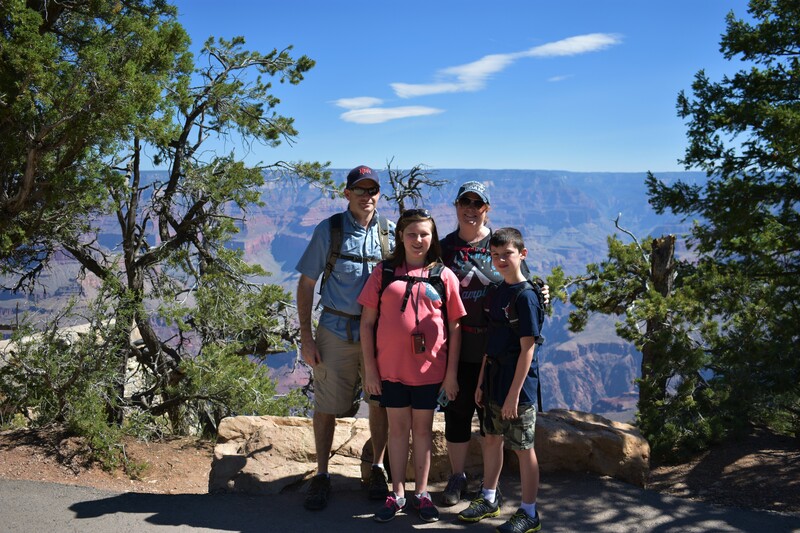 Last summer our family spent 4 and a half days at the South Rim of the Grand Canyon and enjoyed every minute of it. From our first glimpse of the canyon we understood why it is considered one of the 7 Wonders of the World. For all of us our first look at the canyon was from the Rim Trail near Mather Point and we were in complete awe of the vastness of the canyon. The amazing part of viewing the canyon is that the view changes as the sunlight changes. From one moment to the next the view can be drastically different. That is why we were so glad we spent several days in the park and were able to see the canyon from many different viewpoints and at different times throughout the day. 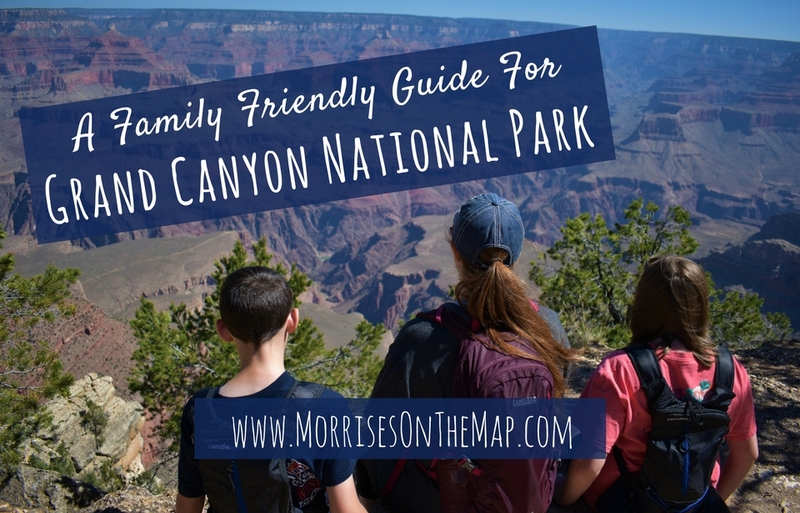 We want you and your family to enjoy your trip to the Grand Canyon as much as we did so we are sharing our tips for making your visit as “Grand” as ours. 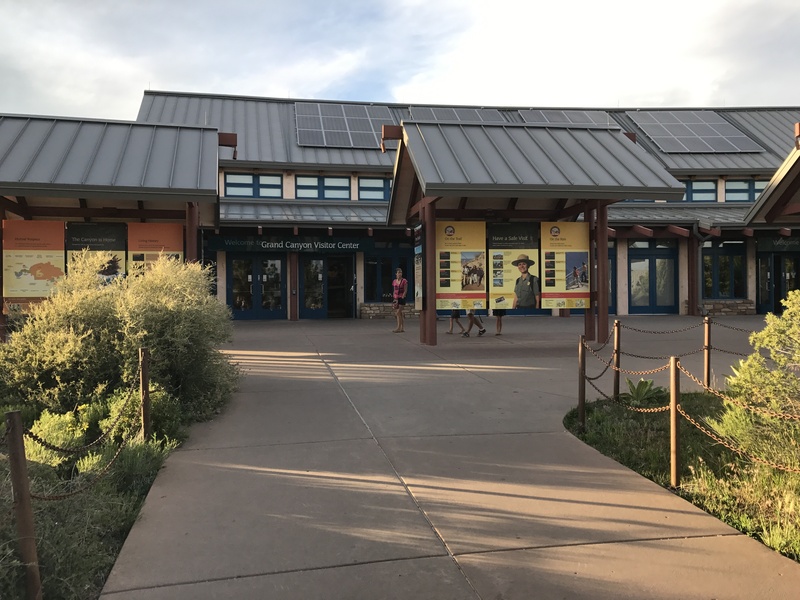 The Grand Canyon Visitor Center should be your first stop when visiting the park. There are many parking areas around the Center if you are visiting from outside the park. 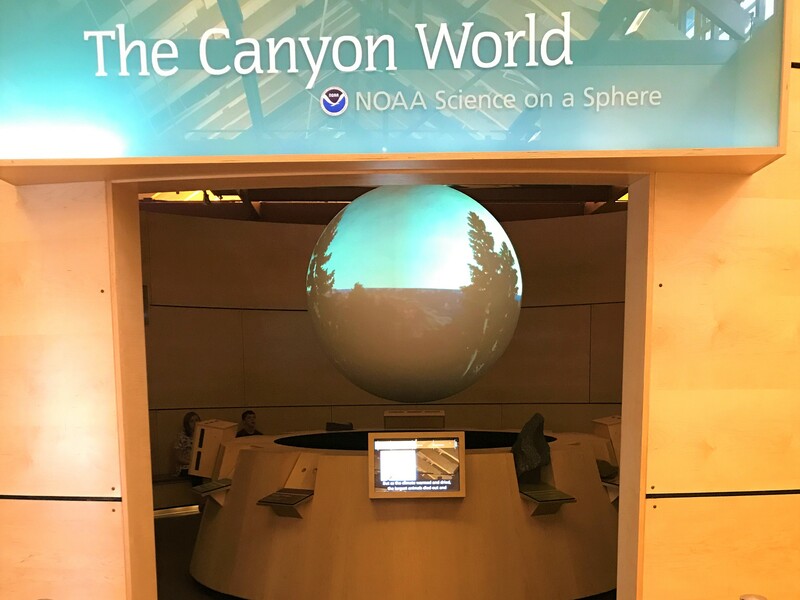 Within the Visitor Center you can view a movie that is a great introduction to the Grand Canyon and how it formed. You can pick up maps of the park and visit with a ranger to find out up to date information on the park. If you have children you can pick up their Junior Ranger Books and you can stamp your National Park Passports.  In this area you will find a park store, restrooms, bike rentals and a small cafe. Of the two visitor centers on the South Rim, this is the one we liked best. 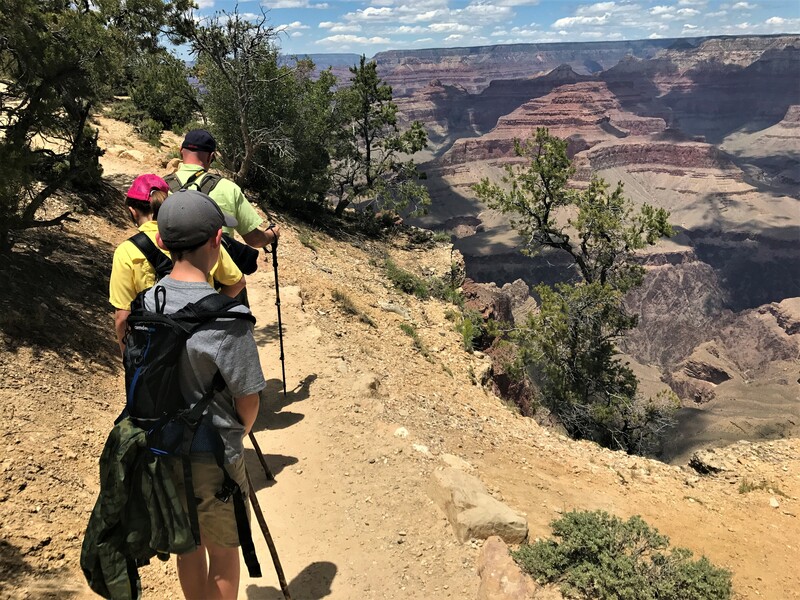 For your first view of the Grand Canyon you only have to walk a short distance behind the Grand Canyon Visitor Center to find the Rim Trail and Mather Point. Our first view of the canyon came from this part of the trail. This is a popular spot to watch the sun rise and set over the canyon. 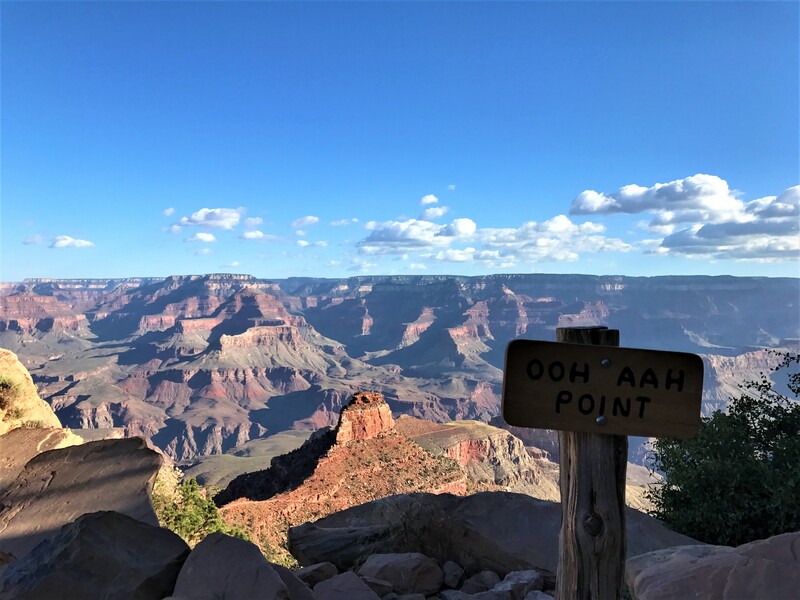 We recommend you visit Mather Point several times throughout your stay. Our personal favorite time to visit was for the sunrise. We arrived at the point about 40 minutes before sunrise and watched it rise over the canyon with about 100 other people. You may be thinking that is a lot of people, but everyone was so quiet and all of us were blown away by how the canyon changed as the sun began to rise over the canyon. 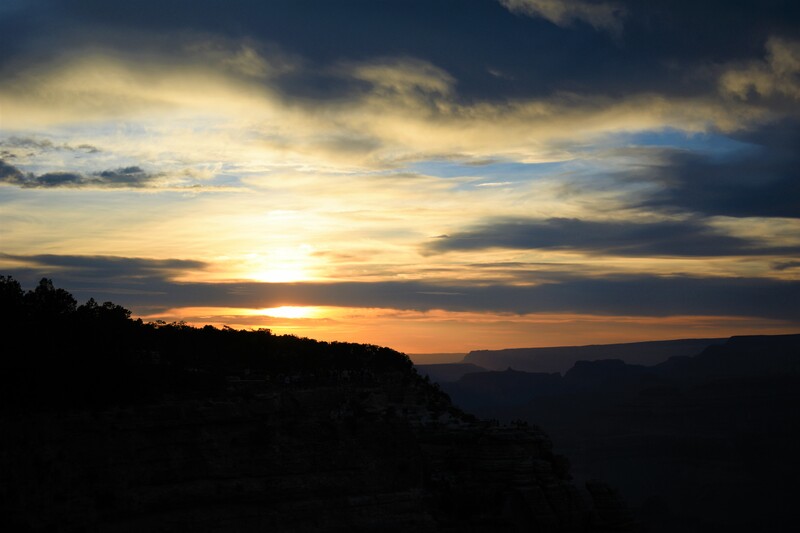 Our fifth grade son, wrote a paper all about watching the sunrise over the canyon and how it was one of the most beautiful sights he has ever seen. Waking up early and going to sleep late in order to see the sunrise and sunset are an absolute must when visiting the park. The Rim trail runs along the rim of the canyon and is 13 miles one way. You do not have to hike the entire trail at one time. During our four day visit we walked most of the trail. 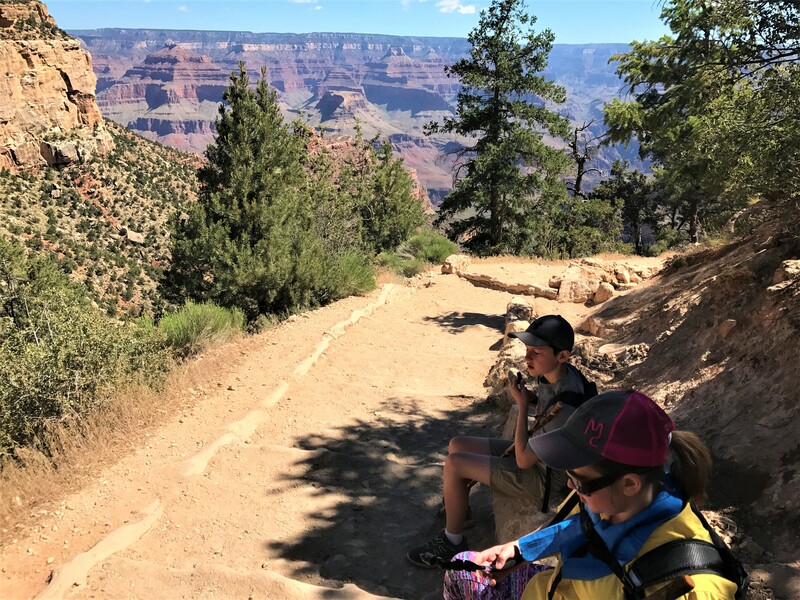 The first day we walked from Mather Point to Yavapai Point (.7 miles) and then from Yavapai Point to Verkamp’s Visitor Center (1.4 miles) in the Village section of the park. The Yavapai Point Geology Museum offers a beautiful view of the canyon, as well as a look at how the canyon was formed. 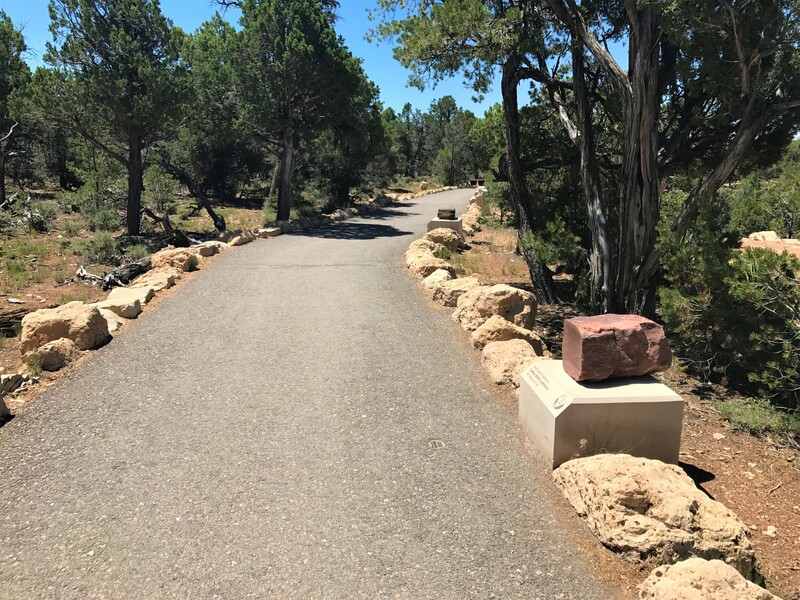 From Yavapai Point to Verkamp’s Visitor Center you will be walking along the Rim Trail as well as the Trail of Time. This section has exhibits along the way that show you how old the different layers of the canyon are and what they are made of. Our favorite part of the trail is the section from Maricopa Point to Hermits Rest (6+ miles). This part of the trail is not paved and can get kind of close to the edge for those that do not like heights. We would not recommend this part of the trail for those with younger children. The best part about this section is that you can make your hike as short or as long as you would like. There are 9 bus stops along this section and you can get off at one stop, hike as far as you would like and then catch a bus to the next stop. You will also find this part of the trail to be less crowded than the paved section of the Rim Trail. We did not walk to entire way from Maricopa Point to Hermits Rest, but that is on our list for our next visit. 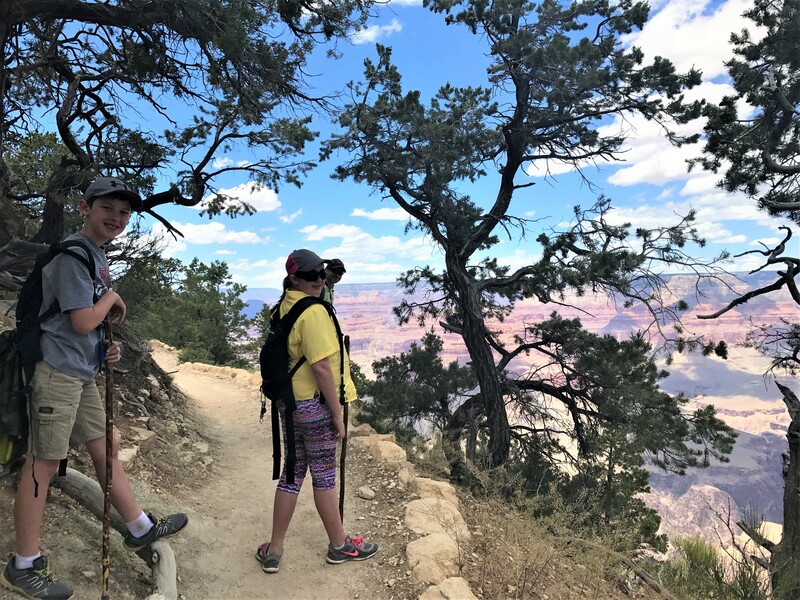 If you want to hike down into the canyon the Bright Angel Trail is one of the trails you can take. This 18 mile trail is considered to be very difficult. 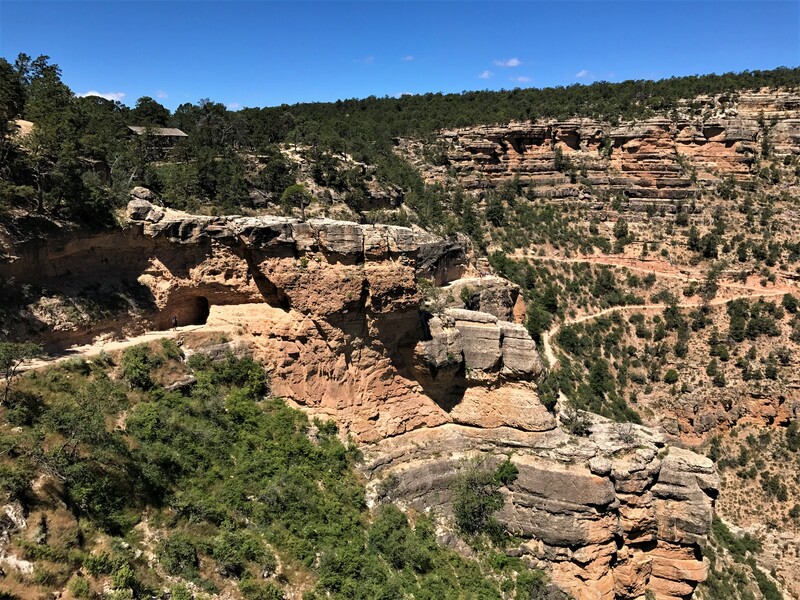 You should not plan on hiking to the bottom of the canyon unless you plan to spend the night and have a backcounty permit. As you walk this fairly wide trail down into the canyon you will have some amazing views. For those wanting just a day hike you can hike to the 1.5 mile Resthouse or 3 Mile Resthouse. Our tips for this hike are to go early in the morning if hiking in the summer to beat the heat and to make sure you have a sufficient amount of water for everyone hiking with you. This trail can fool you into believing it is easy. You start the hike going downhill but then you must turn around and come back up the trail. That is when you realize that going up is much harder than going down into the canyon. So do not wait until you are tired to turn around. Our plan was to hike to the 1.5 mile Resthouse, but we ended up turning around before that point at the second tunnel. We started the hike around 8:30 in the morning but we recommend starting earlier, because it gets warm pretty fast during the summer. This trail offers very little shade and you can get overheated really quickly if you are not careful. On our trip up the trail, we took frequent stops to enjoy the views and to cool off. 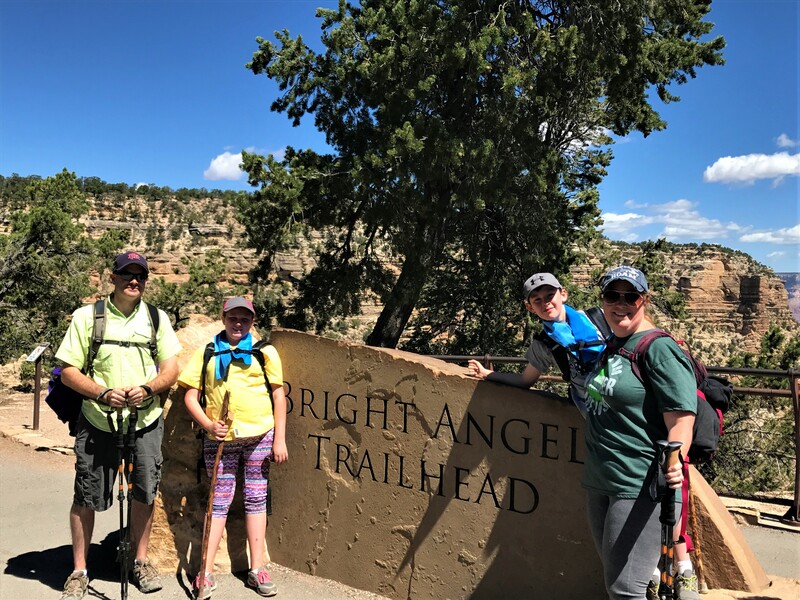 At the trailhead you will find a restroom and just down the rim trail you can get a snack at the Bright Angel Lodge to celebrate making it back up the trail. The South Kaibab Trail is another trail that you can take down into the canyon. This trail follows a ridge instead of side canyons and is very steep. If you are traveling with younger kids, we do not recommend this trail. Like the Bright Angel Trail you should not plan on hiking to the bottom of the canyon without a backcountry permit for spending the night. . Our goal was to hike to Cedar Ridge (1.5 miles), but the day we hiked it was very windy and we decided to turn around at Ooh Ahh Point (.9 miles). The view from Ooh Ahh Point is truly “ooh ahh” worthy and should not be missed. On this trail there is a little shade if hiking in the morning, but the only water available is at the trailhead, so make sure you bring plenty of water for everyone hiking. 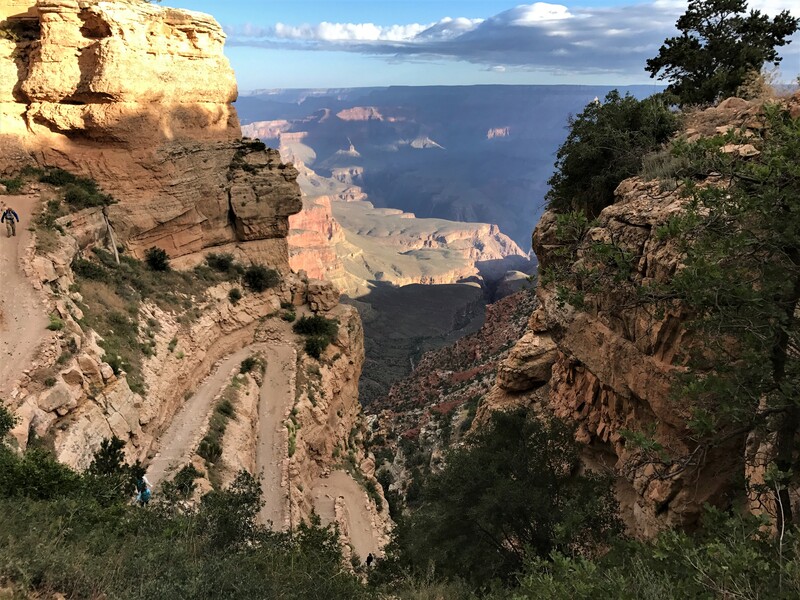 The drive from The Grand Canyon Visitor Center to the Desert View Area of the Park offers several viewing points along the way and a few not to be missed stops. 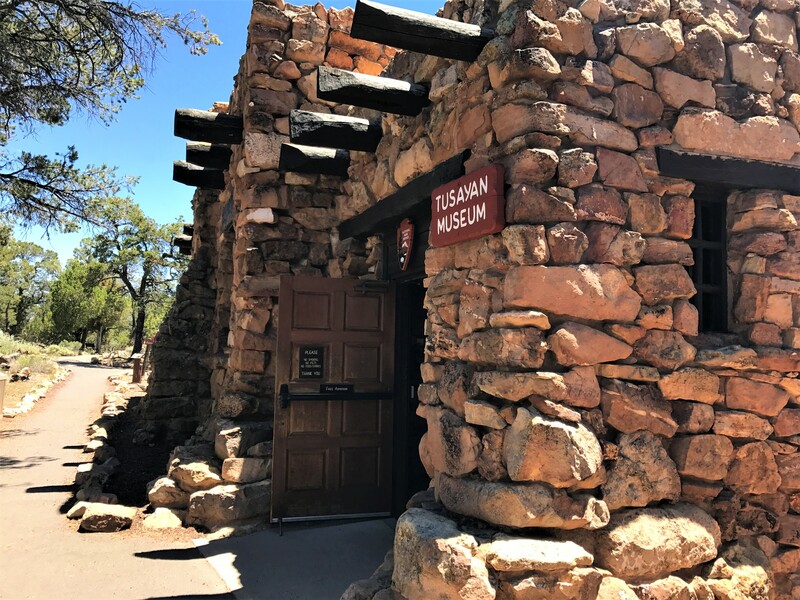 The Tusayan Museum and Ruins is a quick stop that has a short trail through the ruins of a Ancestral Puebloan village and a small museum. Check your park guide to find out the time for a ranger led hike through the ruins. 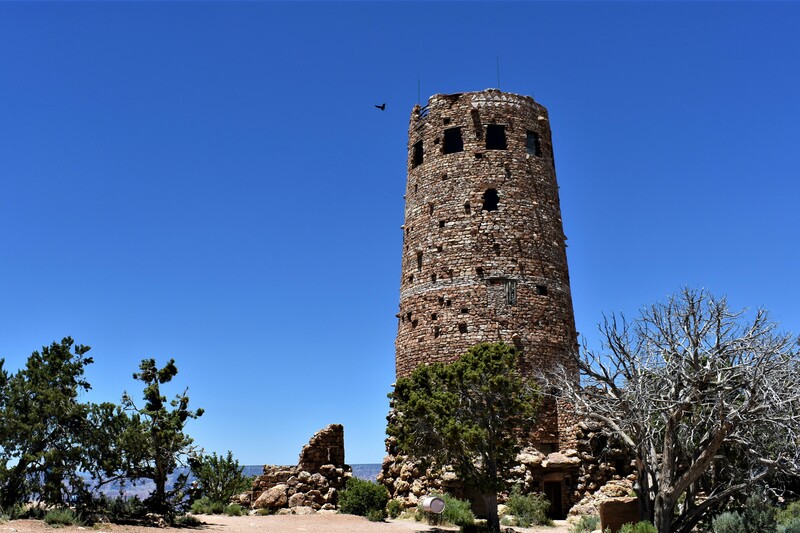 The Desert View Watchtower offers a 360 degree view of the Grand Canyon and is well worth the narrow and crowded staircase you must climb to get to the top of the tower. In the Desert View Area of the park you will find a Trading Post, snack bar, service station and market. The Village area of the park is a great area to spend a few hours. It offers great views from the Rim Trail, but there are also several fun places to visit. 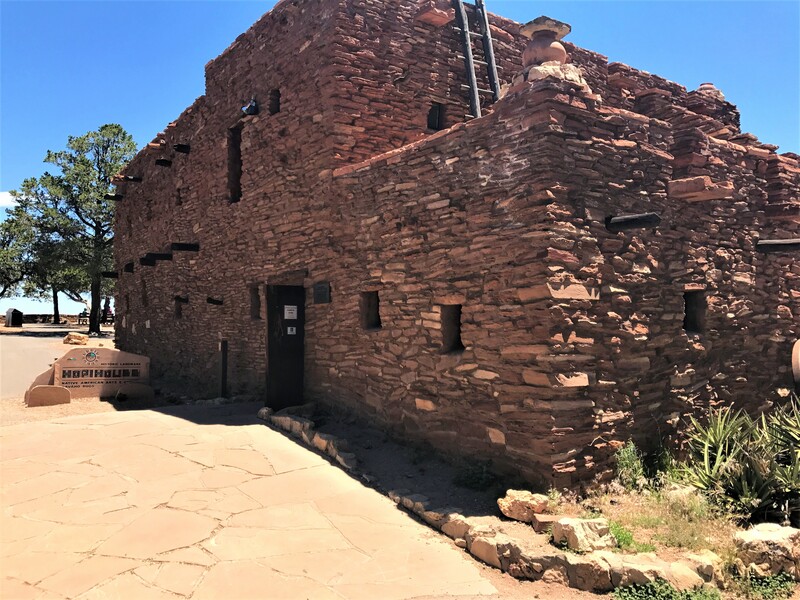 The Hopi House is a National Historic Landmark and Native American crafts are for sale on the first floor and there is an art gallery on the second floor. 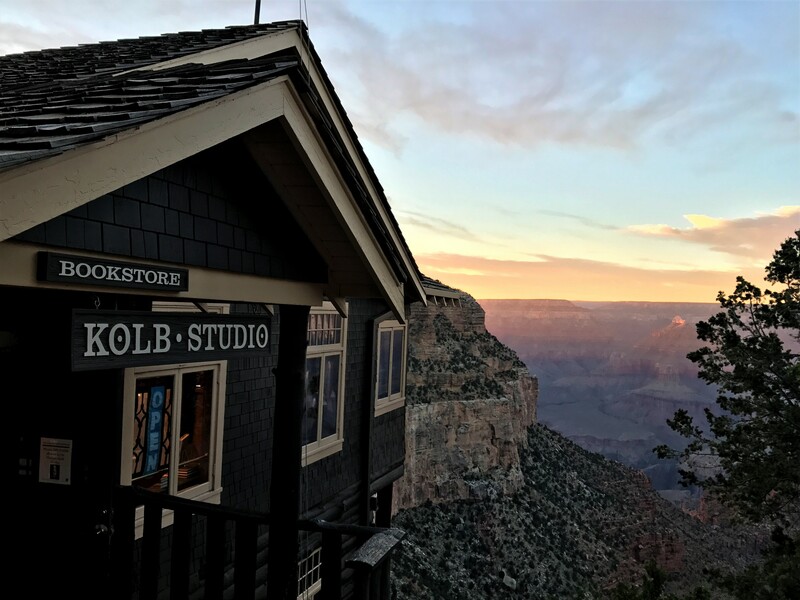 One of our favorite non hiking stops at the Grand Canyon was the Kolb Studio. The Kolb Studio was once the photographic studio and home of the Kolb brothers. On the main floor you will find a bookstore and a balcony overlooking the canyon. When we visited the park the bottom floor was an exhibit on the Kolb brothers. We were all impressed by the boat the brothers built to navigate the Colorado River and the photos of their adventures throughout the Canyon. Our kids enjoyed a Ranger talk on the porch at the El Trovar Hotel about the wildlife in the park. Be sure to check out the Ranger talk schedule in the park newspaper when you arrive. If you have a child that enjoys trains you can watch the arrival or departure of the Grand Canyon Train from the Train Depot. Just check the Depot for arrival and departure times. 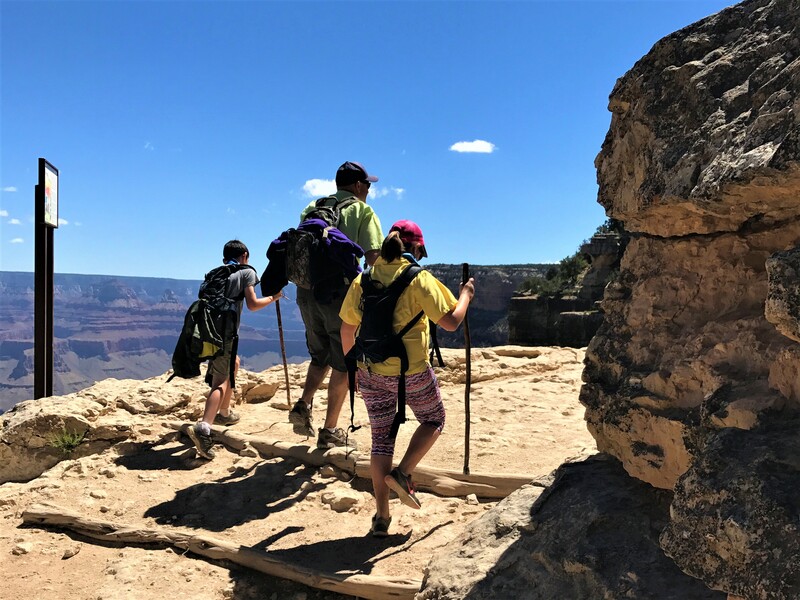 Hiking at the Grand Canyon can be a lot of fun for families, but there are some precautions you should take if you are hiking during the summer months. -Remember to bring enough water for everyone hiking. -Hike early in the day or late in the afternoon. -Going down into the canyon is optional, coming back out is mandatory. -It will take twice as long to hike up the trail as it did to go down the trail. 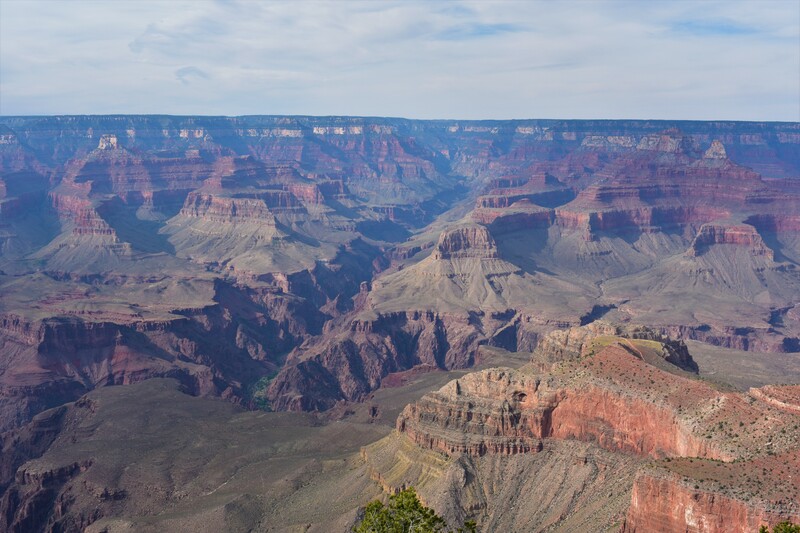 Grand Canyon National Park offers a free shuttle service. There are several parking areas in the park with bus stops. All of the main attractions have shuttle stops and during the day the shuttles run every 15 minutes. They run every 30 minutes during the hour before sunrise and the hour after sunset. We found the shuttle system to be easy to use and the shuttles were not overly crowded during our visit. All strollers must be collapsed before entering the shuttle and you may not bring jogging or over-sized strollers on the bus. 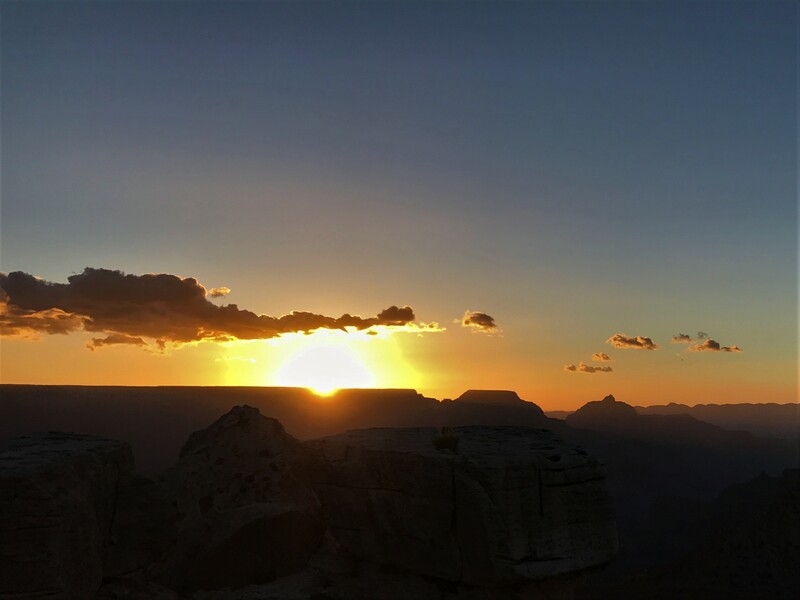 If you are visiting Mather Point for the sunrise we suggest driving to the Grand Canyon Visitor Center and parking in the parking area. There will be plenty of parking at that time of the day. 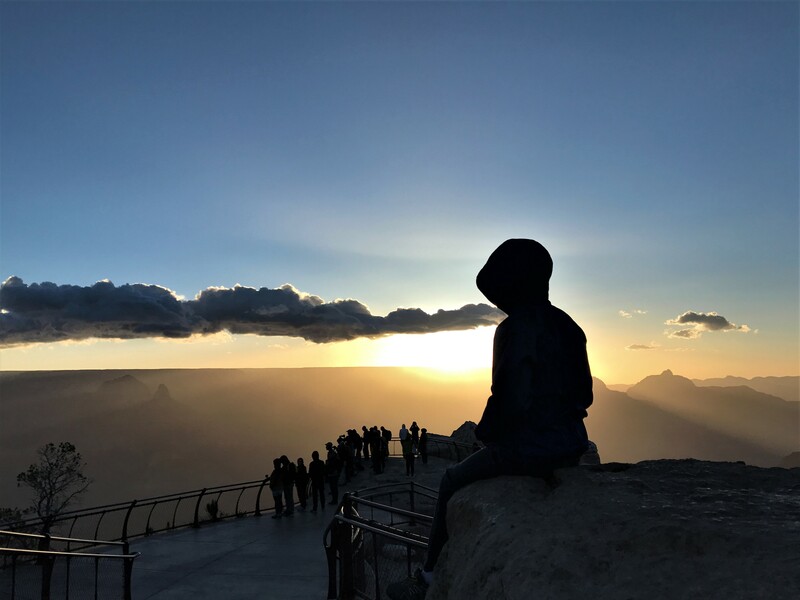 Whether you choose to spend a day, or a week at the south rim of the Grand Canyon, you will have plenty to keep you busy. We hope you enjoy your visit to the park as much as we did! Please leave a comment if you have any questions or have something you enjoyed at the park that we did not write about. Happy memory making!